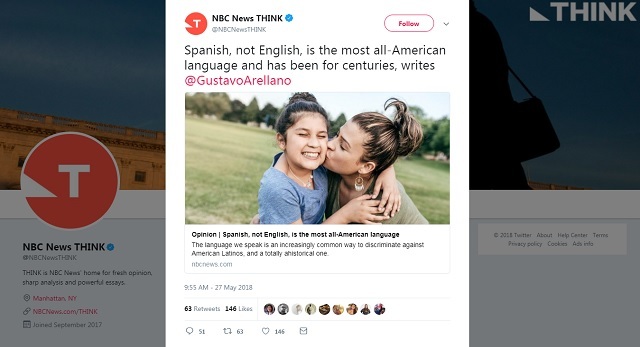 "Get with the program, racists, and learn Spanish," writes NBC News "THINK" contributor and LA Times columnist Gustavo Arellano. So why do some Americans keep freaking out about Latinos speaking Spanish? Part of it is anti-Latino sentiment, for sure. And our president has emboldened xenophobes like few presidents since Woodrow Wilson. But a better explanation is that it’s a reminder that our country has historically been fine with citizens speaking more than one language. The Continental Congress printed documents in German and French. German bilingual schools existed across the Midwest right up until World War II. And, like the song said, even Old New York was once New Amsterdam (where people spoke Dutch). Now, with an increasingly diverse America, speaking Spanish is just going back to our roots — roots that modern-day Know-Nothings fear being left out of. Indeed, our "roots" of Spanish conquistadors imposing their language on the native Mexican population (where Arellano's is from). Thankfully, today’s internet culture quickly deems anyone who freaks out about someone speaking Spanish in public a pendejo. That jerk Manhattan lawyer? A crowd-funded mariachi not only played outside of his apartment, but the attorney also got booted from his office and eventually apologized. Same with the Jersey teacher. Good people are not only realizing that speaking a foreign language is okay, but that it’s not okay to be racist about it. So get with the program, racists, and learn Spanish. And for the record: when we speak Español, we’re not talking about you. We don’t even care about you. Truly a message of togetherness!